I love having flowers in my house but despite the fact we have a garden full of them I never quite manage to put them into vases in the house. Hopefully this will change next year as I plan to have a lot of cut flowers down at the allotment so keep an eye out as I will hopefully be writing a post on that soon. I rarely get bought flowers anymore (I know, woe is me!) and if I do they are usually reduced and die within a few days! So when Prestige Flowers sent me their Tikal flowers I was over the moon. These flowers are from their luxury range and I would say they really are luxury. 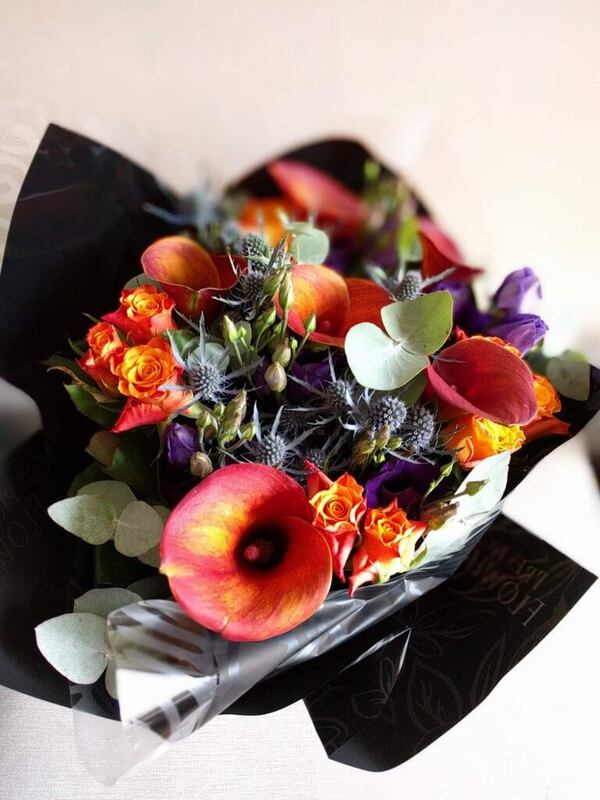 They are usually £49.99 however at the moment they are on offer at £34.99 for a standard bouquet, £39.99 for medium, or £44.99 for a large bouquet. Unfortunately when my flowers were delivered I was out so I got a little note from Royal Mail saying I need to collect them from the Sorting Office. It is frustrating that Royal Mail won’t leave deliveries with neighbours anymore, as it’s quite a trip out to our Sorting Office. That is Royal Mail’s fault though, not Prestige Flowers. Although, they could probably use a different courier, but I’m guessing that using Royal Mail enables them to keep their prices lower. My flowers were delivered in a large cardboard box, which rather than throwing out we’ve now cut large holes in the sides and Isla uses it to post things through like a post box. She absolutely loves it. 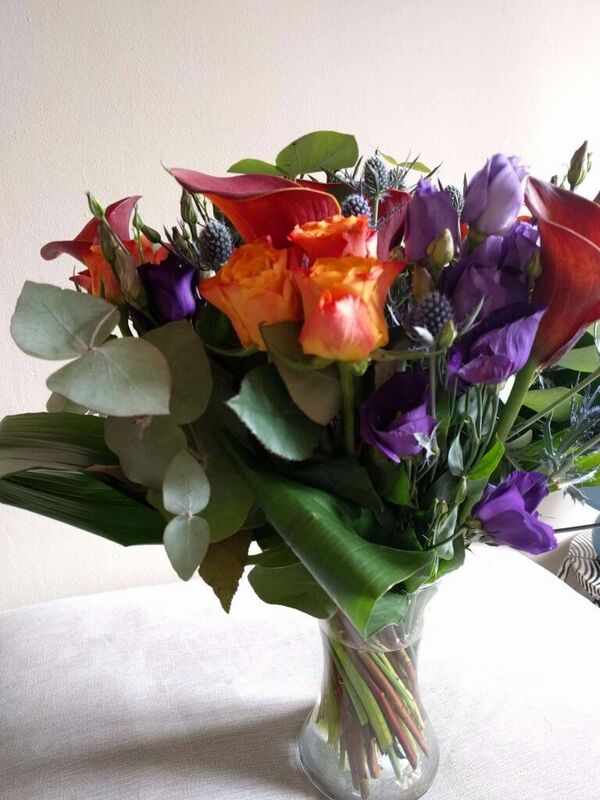 Also in the box came a lovely vase for the flowers to go, which you can add to your order for £5.99, as well as various other bits and pieces like chocolates, a teddy bear, or a bottle of fizz! 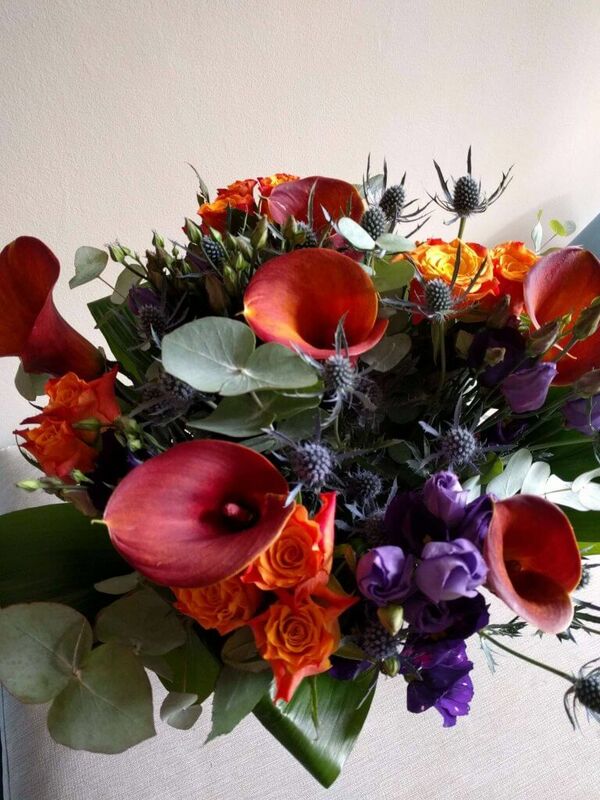 The day that I picked up my flowers from the Sorting Office we had friends round and they immediately commented on my flowers and said as to how wonderfully autumnal the colours were. Which is exactly what I had thought as soon as I opened them up. 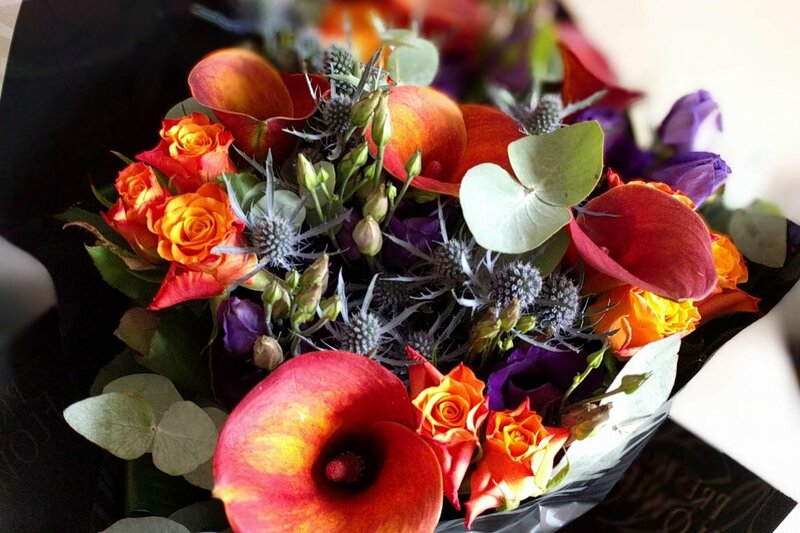 They really are a lovely selection of flowers and the colours are just amazing. I almost feel as though they could do with a few white flowers in there, just to make the dark purple flowers stand out a bit as I feel they can get quite lost within all the foliage, but I guess then it wouldn’t look quite as autumnal. The flowers come with some advice as to how to care for them. It suggests that you snip each stem at a 45 degree angle and that will help them last longer. This can prove a little tricky if you don’t want to disturb the beautiful arrangement they are already in. If you’re like me though, and are rubbish at arranging flowers you can keep them in the packaging and snip through the stems from the bottom. This took me quite a while to do but it did mean that the flowers held their arrangement and so they look much better than that I could ever have done. I then popped them in the vase with some luke-warm water, and my living room was instantly brightened up. As it is such a large bunch of flowers I needed to top the water up regularly, as they were very thirsty. I’d forgotten to do this on one day, and it does mean that the roses have started to wilt a lot quicker than they usually would. Prestige have their range of Christmas flowers out at the moment which I’ve been eyeing up and they are pretty spectacular. They range from £19.99 for the Merry Christmas selection which have roses and some gorgeous lilies in there, all the way up to £85 for the Festive Elegance which come arranged in a hat box. I’ve also just had a look on their birthday selection and they have a fantastic one which is called Roses and Gin. It’s currently £29.99 and includes a beautiful rose plant, as well as a gin & tonic scented candle, a small bottle of gin, and a small bottle of Fever Tree tonic water. How amazing is that!? Forget waiting til my birthday, Happy Wednesday! 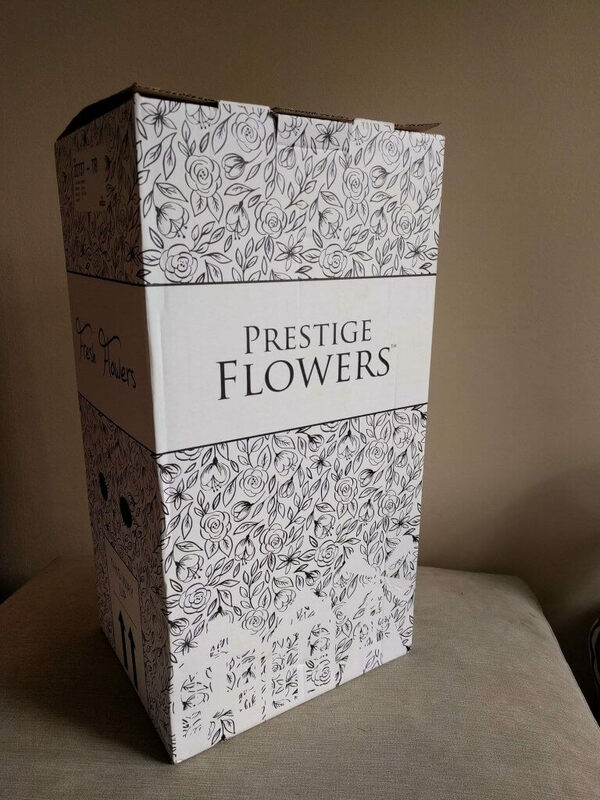 Overall I’ve been really impressed with Prestige Flowers and the quality of their flowers. They really are beautiful, and are definitely a company I will think of next time I plan on sending flowers.